Black belt Nic Ruben Nikolaisen from Frontline Academy invites you to a great week of training! Our camps are held in a friendly and relaxed atmosphere in beautiful and sunny Fuerteventura. We welcome people from all academies and all levels – no problem if you are a beginner! Corralejo, Fuerteventura. Read more about the town here! Fuerteventura offers over 150km of pristine beaches with crystal clear water. The island has perfect temperature almost all year around, which makes the camp a perfect combination of training and relaxation. Fuerteventura also has amazing surfing and kiting conditions, and we can organize surfing and kiting trips for everyone from complete beginners to professionals. We will also arrange other activities such as BBQs, tasty dinners, hiking and sunbathing on the beaches. Dates for the next camp will be announced soon! Accommodation incl. towels and linen. 10 x BJJ/SW group sessions. Dinner the the house (paella). One gi cleaning (mid week). We are going to stay at a villa that is usually a surf camp, and it only takes 10 minutes by car to the beach and the city center! Right outside our door we also have a large area with sunbeds, outside showers and a BBQ area. Most people will stay in rooms with four beds and shared bathrooms. There are only a few rooms with 2 beds/double beds (couples will have first priority). If you want to bring your family or want to stay by yourself, we are located only 2 minutes away from a very family friendly hotel. Send us an email and we will send you more information about your options. You can also bring someone who does not train, that is not an issue. We will give you a price without training and a private room. There is a beautiful lounge outside for sunbathing and relaxation at the villa. It is also possible to book massages at the villa for those who need some extra relaxation. There are two kitchens and a large BBQ area right outside the villa, and this arrangement makes it is easy to cook all the food you need here. There are also a lot of good restaurants only a 10 minute drive from where we live, where you can buy anything from pretty cheap meals (€10) to more expensive meals (€20–25) with drinks and dessert. 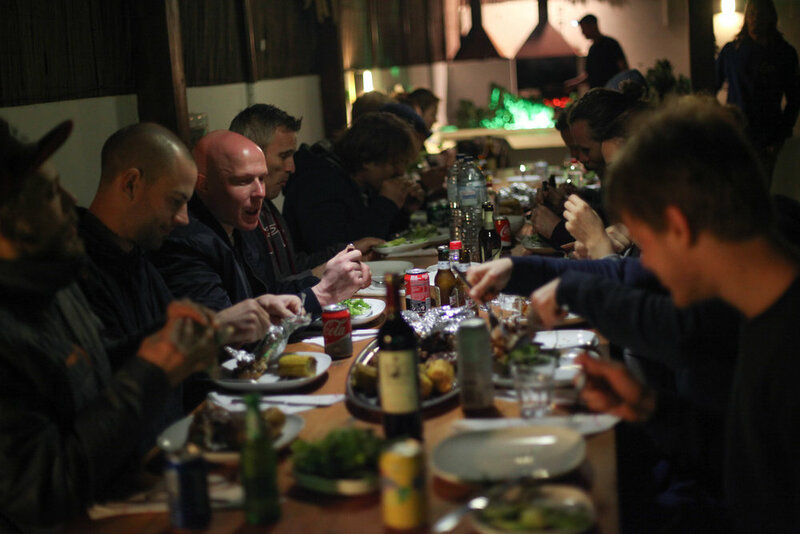 We often invite people to join for social BBQs and dinners in town. Everyone has to organize their own travels asap (flights to Fuerteventura does get sold out weeks prior to the travel date). If you want to travel from Norway, we highly recommend that you to check out norwegian.no. If you book early, Norwegian has quite cheap direct flights to Fuerteventura from Oslo on Saturdays 11:40 am and return flights the week after. We will rent fully insured rental cars including gas and organize people into groups with one or two assigned drivers. Please note that we will not be held responsible if one of the following occurs: 1) Other people than the assigned driver, drives the car. 2) Reckless driving. 3) Driving off road including dirt roads. There are ONLY 20 spots – Book yours NOW! This booking is a binding registration (non-refundable). Please make sure you read all the abovementioned information before you sign up.